A neat little download for sportsbetting, the Coral mobile app offers a range of markets, live streaming all UK and Irish horse races and in-play betting on thousands of major sporting events around the world. The mobile coral app may not be the most technologically advanced betting application on the market, but it makes up for this small downfall by providing a simple, effective and easy to use platform for those who are more concerned with placing bets than flashy gimmicks. The Coral mobile betting app gives users the ability to place in-play bets on thousands of sporting events straight from their mobile devices. 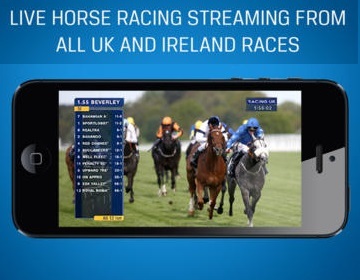 The app also provides live streaming of every UK and Irish horseracing event, however, you will need to place a minimum bet of £1 on a race before you can watch it on your smartphone or tablet. 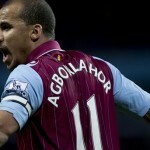 Accessing these and other mobile coral betting features is simple and intuitive, thanks to a layout that cuts out the fat in favour of quick and simple betting. To navigate through the app, simply touch the tabs at the top of the home screen to view Coral’s promotions, your betting slips. Like other mobile betting apps, Coral welcomes new customers with a sign up bonus that will give you a £20 free bet after you place your first £5 stake. Another great promotion on offer at Coral is their Money Back offer if your horse is beaten by a head at any UK flat meeting. Sometimes simple is better, especially when you’re looking for a fast way to place bets from your mobile device. While it is a basic app, Coral on mobile is user friendly, cleverly organized and takes the headache out of placing bets on the go. 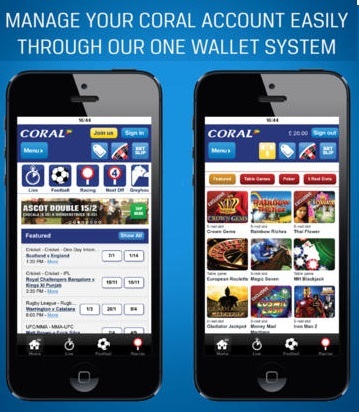 To check out the Coral mobile sports betting app, download it here and treat yourself to a free bet worth up to £20.